For the second year in a row, the grass fields at Los Establos de Cap Cana (Dominican Republic) are the venue for the FCBEscola Las Americas International Tournament, a regional competition for the club’s many schools in the continent, plus guests from Japan and Barcelona. The second edition gets going on December 15 with a record number of entrants, up 30% on last year. FCBEscola Katsushika Rakuten and FCBEscola Barcelona were the first teams to arrive in the Caribbean and begin preparations for play. 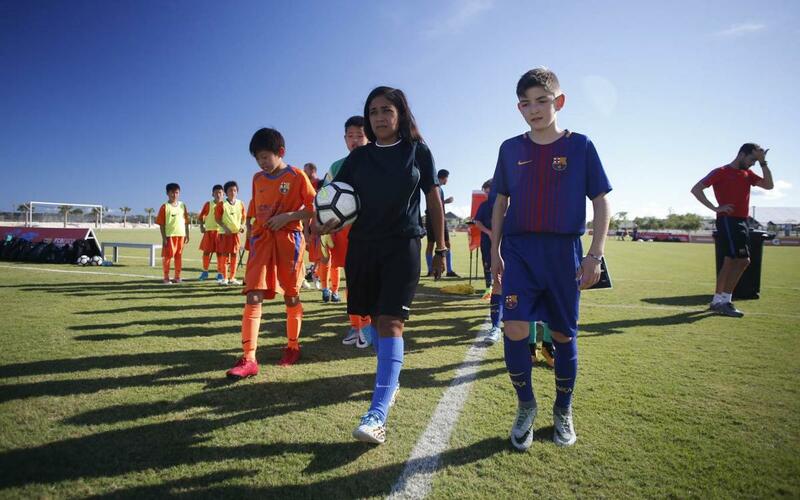 The only such tournament not to be held on the FC Barcelona facilities involves 38 boys and girls teams from 8 to 13 years representing 7 countries and 13 different FCBEscolas and FCBCamps for three days of fun and games. The countries taking part are Japan (FCBEscola Fukuoka Rakuten and FCBEscola Katsushika Rakuten), Brazil (FCBEscola Rio de Janeiro), Colombia (FCBEscola Bogota), Guatemala (FCBEscola Guatemala), the United States (FCBEscola Austin, FCBEscola Charlotte, FCBEscola Chicago, FCBEscola Charlotte and mixed team from the different FCBCamps), FCBEscola República Dominicana and FCBEscola Barcelona. The opening ceremony is being held on the polo field at Los Establos de Cap Cana on Friday at 9.00 am, and the first fixtures start just an hour after, in the Formation category, preside by the president of FCBEscola República Dominicana, Fabeka Lebrón, and the international project director for FCBEscola in America and the Middle East, Fredi Martín. The finals will be played at the same place on Sunday 17 from 12.00 noon onwards. This year’s edition is a considerably bigger affair than the already massive event held at the same venue a year ago. In Formation (born 2008 and 2009), there are four new teams, and in Competition (born 2004 and 2005), there are 12, twice the figure in 2016. The youngsters will also get to enjoy the richness of the local scenery and culture, with visits to some amazing sites of natural interest to make their time in the Dominican Republic even more unforgettable, while also generating fellowship and team ethics among the children taking part. To help forge friendships, a number of additional activities will be taking place for when the participants aren’t playing matches. These include a Pro Evolution Soccer competition, the Gatorade Bottle Challenge, Gatorade Soccer Ping Pong, a Nike lounge and different contents for honing their soccer skills. FC Barcelona stars Ivan Rakitic and Jordi Alba feature in the video that has been promoting the tournament on the FCBEscola and club social networks in the build-up to the big day. They appear along with members of the different schools encouraging everyone to come along and take part, and offering advice for making the very most out of their time in the Dominican Republic.